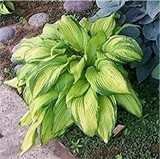 In this shade garden design, a mixture of hosta varieties was used. 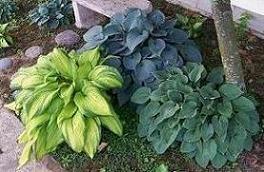 This picture of a small portion of the area gives you an indication of the wide range of leaf color and leaf shapes that are available in hosta plants. 'On Stage', 'Halcyon' (slug-resistant), and 'Blue Cadet'. A cement bench was placed between two Amelanchier serviceberry trees to give a "come take a break and relax" feel to the area. Flat rocks were placed in front of the bench for easy access to seating. The Amelanchier trees were chosen for their small size and beautiful fall colors. The trees sprout white spring flowers that then give way to 1/4" fruit the birds can enjoy. Snow Trillium (Wake-Robin) Trillium grandiflorum were set along the back edge of the hosta bed to provide early spring interest before the hosta plants begin their growth for the season. Snow Trillium bear 3-5in flowers that are white or white tinged with pink; the white flowers fade to pink and then to rose. 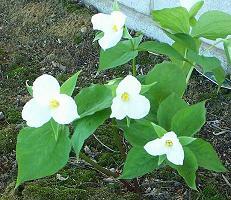 Leave, rather than cut back, trillium leaves becasue they proivde the plant with nourishment for the next year. 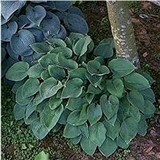 There are other shade plants you may want to add for additional color: Aquilegia ('Columbine'), Astilbe ('False Spirea'), Campanula ('Bell Flower'), Helleborus ('Lenten Rose') or even Heuchera (Coral Bells) which have a wide variety of foliage colors, forms and textures.